My daughter was always on the small side, staying right around the 25% in both height and weight. But around age ten, she began slipping on the growth charts. We were concerned and her pediatrician ordered a bone age test. This quick, painless test (an x-ray of your hand) revealed that my daughter’s bones were about two years behind her chronological age. That was good news - it meant she had plenty of time to catch up and was possibly just a “late bloomer.” We decided to keep on eye on things. By age twelve, it was clear my daughter had stopped growing. Whereas normal rate of growth is 2 inches a year, my daughter had grown barely half an inch. She completely fell off the growth charts. She was almost a teenager but often mistaken for someone much younger. While her peers were going through major growth spurts, my daughter barely wore a girl’s size 8 and wasn’t developing. Our pediatrician felt it was time to consult a specialist and run further tests. We were lucky in that a highly respected endocrinologist practiced fifteen minutes from our house. (Many families must travel hours or out of state.) Turns out, my daughter has Growth Hormone Deficiency, also called Pituitary Dwarfism. She began hormone treatment (daily injections) and in the last year-and-a-half she has grown 5.5 inches and put on 35 pounds. She is now back to the 25 % in height and, if she stays on her current rate of growth, she’ll likely end up a bit taller than me! She’s thrilled that she looks like the high school freshman she is and loves shopping in the juniors department and buying shoes (something she hadn’t had to do in two years). Many people believe that HGH (human growth hormone) treatment is for cosmetic purposes only. Nothing could be further than the truth. Short stature can cause some frustrations and self-esteem issues, but growth hormone affects all kinds of internal things, such as bone development, muscle tone, fertility and heart and lung function. It has real and serious medical repercussions. I didn’t care if my daughter was short, I only wanted her healthy. Because of treatment, my daughter can now keep up in dance and taekwondo classes without getting tired or having her heart pounding out of control. She’s eating and sleeping better and getting stronger. Why am I sharing this all today? 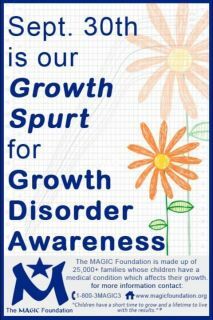 Because today is the unofficial “Growth Disorder Awareness” Day as declared by the MAGIC Foundation. MAGIC stands for Major Aspects of Growth in Children and is a non-profit organization who helps families like mine who have children with rare conditions and diseases that affect growth. It is a fabulous group that provides a wealth of resources and who helped connect me to other moms and dads who know what it’s like to deal with shots, specialists, insurance companies, misinformed family and friends and the stress of having a child with a chronic condition. To celebrate the day, my fellow MiGs and I are happy to announce a special giveaway and fundraising event. Here’s the deal: for every new poster who comments on this post until Oct. 7, I will donate a $1 - up to $60 in honor of the fact my daughter is now 60 inches! (You can comment more than once, of course, but we’re counting individual posters.) AND, to sweeten the deal, each poster will be entered to win a random drawing for one of the books listed below! Be sure to leave your email so we can contact you. Be sure to also let us know what your top two picks are. We’ll do our best to match desired prize to winners. So to recap: comment on this post and you'll be entered to win a book and donate $1 to a worthy charity (without opening your own wallet!) How easy and cool is that? And one more thing, if you are at all concerned about your child’s rate of growth, PLEASE check with your pediatrician and the resources at MAGIC at www.magicfoundation.org. There’s just a short window of opportunity to act. Once a child’s growth plates close, there’s little that can be done. Where Are All The Good Story Ideas? Debbie Ridpath Ohi: My best ideas come when I'm out for a walk. I used to always listen to music or audiobooks when I was out walking but now I tend not to listen to anything except my own thoughts. Inevitably, without really trying, I'll come up with a solution to a plot problem that's bugging me, or a new story idea. Andrea Mack: I usually get my best ideas at the most inconvenient times. I often get them in the shower. There’s something about that running water and not having a pen and pencil that seems to inspire me. Do they make waterproof notebooks? I also get ideas in the middle of the night, when I’m supposed to be sleeping. Christina Farley: My best ideas come when I run. I think part of it is that I'm away from everything that can distract me. 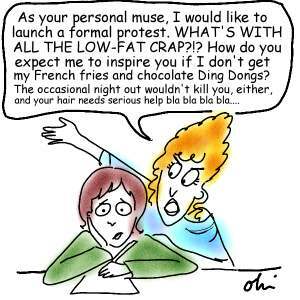 Maybe there is something about endorphins pumping through my body that kicks in that creative adrenaline too! Carmella Van Vleet: I find that I'm most creative, oddly enough, in the shower or bath. I guess there's something about the soothing and warm environment that loosens the cobwebs in my brain. (Maybe I was a mermaid in a former life.) In fact, when I'm stuck I'll often grab my journal and a pen and climb into a hot bath for inspiration. Sometimes I take notes but most of the time I just close my eyes, let my mind drift and play "What If". Maybe it works because my bathroom is the only quiet room in the house! Kate Fall: My best ideas show up when I'm driving, especially when I'm on the same old commute and don't have to pay attention to my route. I cue up a playlist on my iPod that suits my story or shut off the radio altogether. I keep index cards in my purse and have been spotted in parking lots jotting down notes. I also get great ideas while I'm researching and reading non-fiction. And every time I go on vacation, I come up with a story based on the new place I'm visiting. As I posted this comic, I realized that this actually ties in with Andrea's post last Friday. I know some people will disagree, but I think that everything we read influences us as writers. Maybe not directly (e.g. reading a Stephen King novel isn't necessarily going to make me write like Stephen King), but it does go into the melting pot that is my creative muse. I read a wide range of books, from popcorn-type beach reads to nonfiction and literary, but I tend to mostly read books written for young people. Not just because that's what I write but (as Andrea says) because I enjoy them. When I'm writing a novel, though, I try not to read too many books by the same author in a row because I'm worried that that author's style will influence my own a little too much. "I just need a little time." The other day my awesome fellow MiG Kate wrote a really interesting POST about emotional distance. (You should read it for no other reason than it includes a zombie Thomas Jefferson. I kid you not.) And it got me thinking about how and why we make the choices that we do with our stories. I started a new book recently and I found myself wanting to write in first person present tense. I love writing in present tense. It feels very intimate and immediate to me. Everything the MC is going through, the reader can experience first hand in real time. But after I finished my chapter and reread it, I realized that something was missing. Nothing big and flashy happened in the opening. So how could I hint to the reader that something (really interesting, I swear!) is about to happen and they should stick around? If my MC was living in “real time” then she couldn’t tell the reader. But...if she was telling the story of something she’d already experienced, she could provide those hints I needed to build suspense. My mom is a super organizer. She’s been PTO president for three years and can run a fundraiser better than Oprah. Mom is the Queen of Organization. Before everything spun out of control, she was the PTO president for three years. She could raise more money than Oprah. Unfortunately, Mom was one of my casualties. The book of Exodus tells us God is slow to anger. But the people at school and in the community sure weren’t. Just something to think about next time you’re trying to figure out which tense to use! For my writing, I consider it essential to read the kinds of books I write. So, my bedside table is stacked with MG and YA novels (I don't write YA yet, but I like reading them). I tend to read these for enjoyment first, and then afterward, I occasionally think about elements that are related to the craft, like the voice, the language, the dialogue, or the way the story is constructed. I estimate that about 40% to 50% of what I've read over the past couple of years has been books for children. I wonder what the librarians at my local branch library think of me, getting all these kids books on hold? Maybe they think I have 5 kids at home who read all the time! 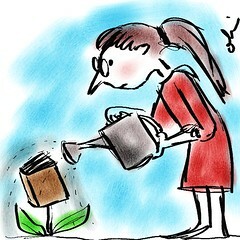 In case you were wondering, outside of kidlit, I read "how-to" writing books (this is beginning to sound like an obsession), blog posts (about writing, of course), books for my teaching job, cookbooks, a quick scan of the daily newspaper, and some adult mysteries and chicklit because I do sometimes want to read about adults. I'm guessing this other reading has less impact on my writing, except for the writing-related nonfiction. What do you read? How much impact do you think it has on your writing? My 14-year-old has this new thing where she combines the word procrastinate and whatever action she’s doing. For example. Me: Are you doing your homework? Her: No. Now, I’m procrasti-watching tv. Well, this morning I wasn’t feeling my next chapter so I was “procrastidesigning.” Now, I’m a huge believer in visualization. Always have been. I decided what my muse needed was a little visual aid, so I spent some time designing a book cover for my WIP. It was easy. I just went to istockphoto.com and searched for a key element in my story. I found something that worked great and I played around with fonts and size until I was happy. Here’s another little visual aid. This dude is important to my story, too. Since I couldn’t find exactly what I wanted, I drew on the LOVE myself. It’s not pretty, but it’ll work. So, hey, next time you need a little inspiration (or want to procrastinate), why not give this idea a shot? Do not be afraid of slow growth, be afraid of no growth. If it wasn’t for the pain and, you know, all the social backlash, I think I’d have this tattooed on my head these days! I don’t care what my fellow Mig Andrea says, I must be the slowest full-time writer in the world. (A writer who doesn’t actually write. Very sad, very sad.) I plod along while everyone around me manages to pump out pages and pages. It’s agonizing sometimes. For the next week, I’m going to try to take the lesson in the quote to heart. I may be slow and plodding along, but at least I’m out there, giving it my best shot. And that’s better than standing still. Okay, I just love this picture. I WANT this t-shirt. Because in the last year I’ve learned a lot about writing, but the most important thing I think I learned was how to revise. I have my typical checklist of things to look for when I’m revising, but this past year I took my revisions to a whole new level. I needed to go even deeper and add another layer to my story. In order to do this, I needed to bring in a number of elements. 1. Motivation- What are my secondary characters’ motivations? How can their motivations in turn affect my main character and the overall plot progression of the novel? 2. Setting- How can I use my setting to create a mood and atmosphere in my story? How can the setting add tension to the story? 3. Character’s perspective- Write about only the things that my main character would notice. Stay in POV! If my character wouldn’t notice the floor, then don’t mention it. And how can the props in the room further add to the story? 4. Purpose- Remind the reader of the main character’s purpose over and over again. Make that end goal almost unachievable. 5. Scene Arc- Every scene must have an arc and must serve a purpose to the overarching plot of the novel. If it doesn’t serve that purpose, axe it. 5. And even better yet, make each scene serve multiple purposes- advancing the inner conflict AND outer conflict. 6. Foreshadowing- Thread in those foreshadowings throughout the story. Start at chapter 1 and work my way through the whole story (often this can’t be done until I’ve written at least two revisions). What about you? 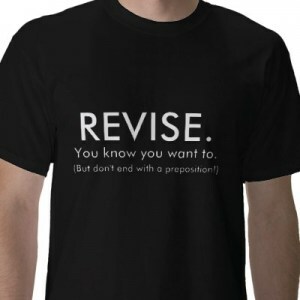 What are some elements in your revisions that you have recently been incorporating? I ran out earlier to do a few errands. One of them was to stop by the high school and pick up tickets to the home opening football game where my 17-year-old son will be marching tonight. As I walked by the main office, I glanced up and saw my oldest son’s banner and it got me thinking about expectations. You see, last year my oldest, Matt, graduated. He was valedictorian and he and another classmate were National Merit Scholarship Finalists. It was the first time in the school’s history that they had Finalists so it was a big deal. The two kids got these humungous banners with their pictures and names. And, like I said, the banners hang right by the front door. I’ve often wondered what my middle child, Sam, thinks about having his brother’s banner up like that. He literally has to walk under it every day. (My youngest, a freshman this year, doesn't have to deal with this as much since she attends a different school.) While Sam is a very smart kid in his own right, he’s not the top of his class. Matt - and I say this with all the love in my heart - is a bit of a freak of nature. I’m guessing it must be rather hard for Sam to live in the shadow of so many expectations from teachers and classmates. (My husband and I have always expected our three kids do nothing but their best. We don’t compare them. Or at least try not to.) How challenging it must be sometimes for Sam to be his own person and shine in his own unique way. I’ve been struggling with the same thing lately. Only, it’s not because of some banner. I’ve been doing it to myself! I got it in my head that if this new project I’m working on - the one that’s barely three pages and a bunch of scribbled notes at the moment - doesn’t land me an agent or sell, I’m gonna pack it up and call it a day as a novelist. Now, how’s *that* for pressure?! No wonder I’ve been having a heck of a time finding my stride. Why on Earth do we do this to ourselves? Our expectation when we begin any project should be to just to do our best. 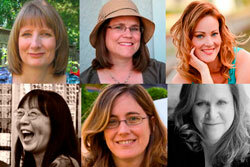 Publication, agents, high sales, book clubs, awards (banners with our pictures and names...) be damned. Sure, I’ve already had a dozen or so non-fiction books published. Some of them have gotten recognition and sold well. But none of that - and I mean NONE of that - has any barring on my current project. I should have no expectations. Just the joy of letting the story grow and shine in its own, unique way. I owe the story, and myself, nothing less.